Covellite is usually found as opaque masses with iridescent blue colours. Also known as covelline, covellite is named after Nicholas Covelli who first discovered it at Mount Vesuvius, Italy. The creativity stone. 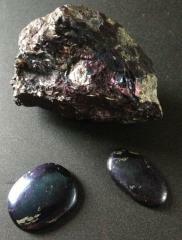 An iridescent copper mineral with an indigo and purple sheen. It is said to work on the intuition and inspiration, imparting force to creativity. It helps one accomplish one’s goals. Covellite is one of the stones of the planet NEPTUNE. Covellite harmonizes with Ajna, The Third Eye Chakra ( 6 ).